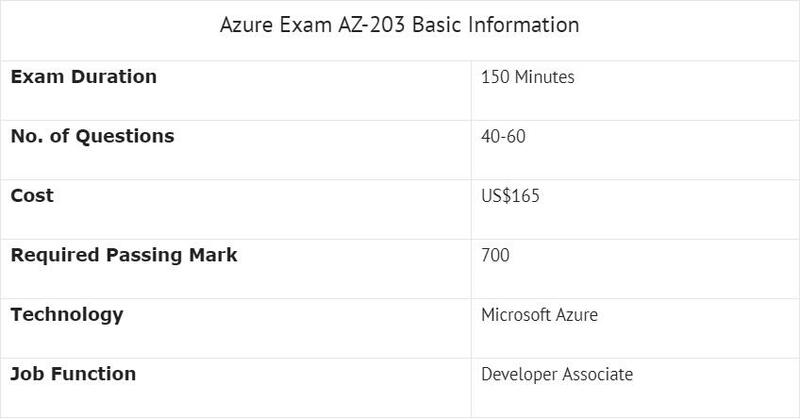 AZ-203 exam is a crucial part of Azure Developer Associate certification. So here we can discuss the methodologies and strategies you can adopt for effective AZ-203 exam preparation.Aspired to become a Microsoft Certified Azure Developer? Passcert Microsoft Azure AZ-203 dumps will help you to prepare and pass Developing Solutions for Microsoft Azure exam. Microsoft initially released AZ-200 and AZ-201 certification exams. But on the basis of the feedback received, they merged the AZ-200 and AZ-201 exams and launched a new AZ-203 exam for the Azure Developer Associate role. The AZ-203 Developing Solutions for Microsoft Azure certification exam tests and validates your expertise as an Azure Developer. This exam tests your expertise across all phases of the Microsoft Azure development process; from solution design, to development and deployment, to testing and maintenance. For the ease of AZ-203 exam preparation, Microsoft has divided the entire exam syllabus into 6 modules. Below, you can find details of these modules and the skills analyzed in each of these modules. The percentage figure indicates the relative weight of the questions from each module. If the percentage is higher, you can expect more questions from this module and vice versa. How do you prepare for AZ-203 Developing Solutions for Microsoft Azure Exam? If you want to become a Microsoft certified Azure Developer Associate, you have two options. In the first option, you need to take a transition exam AZ-202. But, you'll get the desired outcome of taking this exam if and only if you have passed in exam 70-532, Microsoft's original exam for developing Azure solutions. If you haven't taken the exam 70-532, the only option left for you is to take AZ-203 exam. But you can't just spring into the exam as the AZ-203 Developing Solutions for Microsoft Azure exam preparation requires careful planning and implementation. You need to follow the most effective AZ-203 exam preparation strategy along with the right AZ-203 Developing Solutions for Microsoft Azure study materials to get the desired results.